During its seven-year career in the Navy, the Douglas AD-5W Skyraider at the Cavanaugh Flight Museum (CFM) was assigned to VAW- 12 Bats and went to sea nine times aboard seven different aircraft carriers. 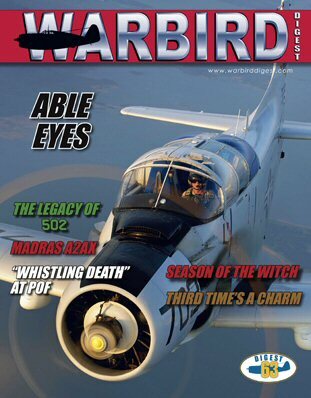 In 2014, after seven years with CFM, museum pilot Chuck Gardner discovered a photo of the Skyraider in VAW-12 colors and the decision was made to repaint the “Guppy” in this historically correct scheme. Prior to the 2015 Reno National Championship Air Races the big news was the fire that nearly consumed fan favorite Precious Metal. Once the racing got underway in the Unlimited class, fans were buzzing. Would “Stevo” Hinton three-peat in Voodoo or would former astronaut “Hoot” Gibson take his first-ever Unlimited Gold at the controls of Strega? Madras, Oregon-based Erickson Aircraft Collection put up five aircraft and hosted aerial photographers from around the world. For three days they learned the finer points of air-to-air photography from three legends of the craft. Everything John “Pappy” Mazza, Jr. learned about safely flying warbirds was learned from his friend and mentor, Walter Ohlrich, Jr., a warbird movement pioneer. After 41 years of ownership, Walt sold his famous SNJ “502” to Pappy, who vowed to preserve the legacy of 502. The Planes of Fame Museum recently highlighted the F4U Corsair at a Living History Event in Chino. The event was extra special due to the presence of five Corsair veterans who captivated the crowd with their stories of flying the “bent wing bird” into the teeth of the enemy. On November 20, 2014, John Romain, owner and chief pilot of the Aircraft Restoration Company, took a Bristol Bolingbroke aloft for its third post-restoration flight in 27 years. Flying from its long-time base at Duxford, the bomber has been finished to represent a Mk.IF long-range fighter from 234 Sqn.